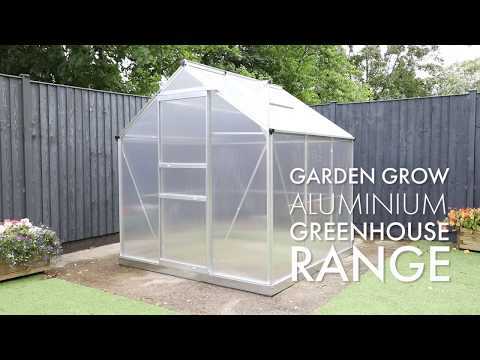 This 6x6ft polycarbonate greenhouse features a strong, silver painted aluminium frame, perfect for growing a wide range of plants and vegetables. Each greenhouse has twin-wall, eco-friendly 4mm thick polycarbonate glazing for an insulated environment. The free running, sliding door means space inside the constructions can be maximized and integral gutters help collect rainwater that can be used at your convenience. There is also a heavy duty galvanised zinc steel base to provide extra strength. All packs include fixtures, fittings and assembly instructions. *Image shown is for illustration purpose only and measures 6.2ft x 8.2ft.